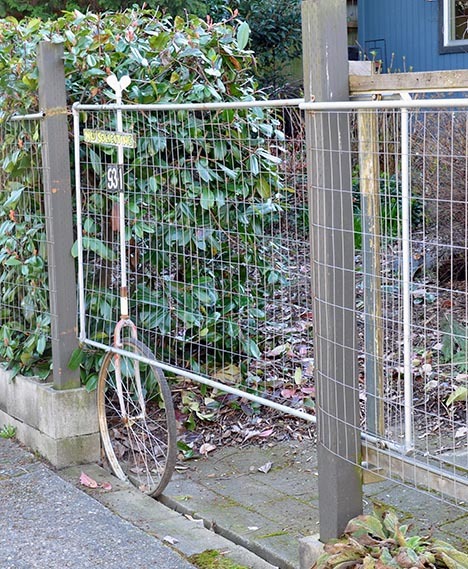 This gate delights me in many ways. While it may have been made by the homeowner, it shows clever use of repurposed materials. I appreciate the movement of the wheel and the large wing-nut used as a handle reminds me of a wind-up toy. The groove in the path is a nice solution to assist with tracking. The bearings on the track are a nice touch also. What catches my eye, after noticing the cobblestones, is the variety of materials used in such close proximity to each other. 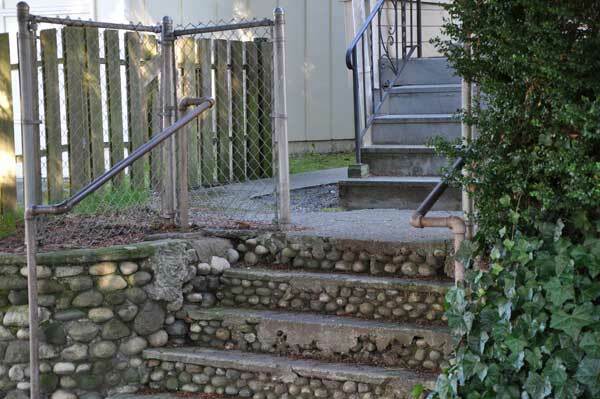 A pipe handrail, chain-link fence, a wood fence and a fabricated railing all live happily together at this person’s entryway. Some things catch my eye while I am out walking about. As a blacksmith/metalworker, it is only natural that I would notice the sort of things that I might be called upon to make. As a designer, I am fascinated by the vast number of solutions that others come up with and what has been done before. 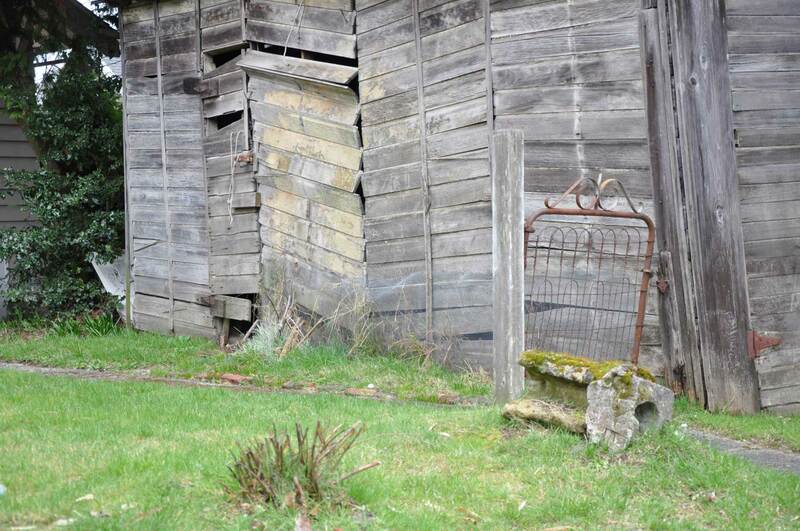 This is a pictoral journey that captures some interesting objects I find during my walks. Some bear strong evidence of a human hand. Some carry the indelible marks of age and speak to a time that has come before. I find all of these interesting in some way. I hope you enjoy walking with me. This is a follow-up to a previous post. 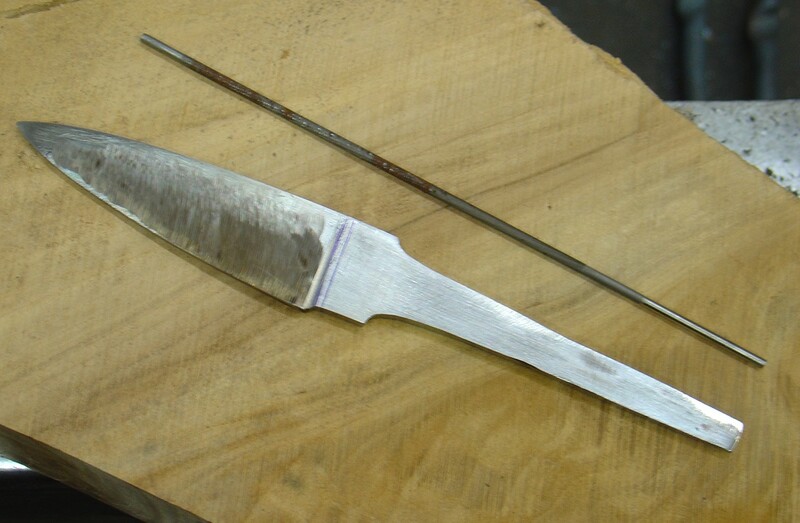 Earlier, I mentioned a knife blade that I had forged and was preparing for heat-treating (hardening). The knife was given a clay resist along the back and also at the end of the tang. The clay prevents whatever area that it is coated with from becoming hard during the heat-treating process. Of course, a watchful eye on the temperature of the knife while it is heating is essential. A few degrees too cold and the knife will not become hard. A few degrees too hot and the clay will not function properly. Or worse, if the temperature gets far too hot, the knife will be brittle. Making steel hard is always exciting for me. The knife is heated until it glows a bright red and is immediately placed into hot oil. Once the knife is removed from the oil bath, the oxides that formed on the surface flake off as the steel reaches room temperature (due to the shrinking of the steel and the growth of the martensite structure). The white areas are where the oxides (scale) has come off. It is also the first strong glimpse into what pattern will be visible on the finished blade. Remember that the metal is pattern-welded? It is a basic ladder-pattern. Because it is only about 42 layers, the pattern is pretty bold. 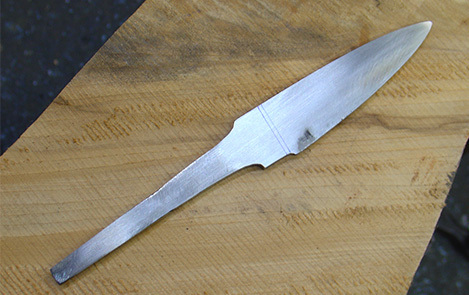 It is crucial that the tempering be done as soon as the knife is cool enough to touch. Although the picture does not show this clearly, the tip and edge have a pale yellow cast. Because my heat-treating was what I would describe as “optimum”, I need to be careful to not get the steel too hot while I grind it to its final shape. A file bites easily into the area along the back (where the clay was) and only just barely bites into the area along the edge. Because the back of the knife is so soft, I can get away with having the edge be a little harder than might be normally expected. After some judicious sanding and finishing with stones, the knife was really beginning to take shape. I had a beautiful piece of Bois de Rose that I was eager to use. 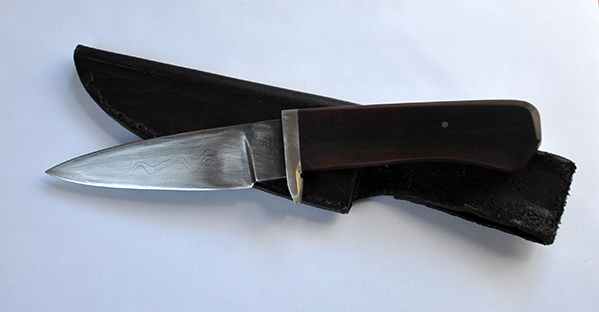 I wanted this knife to have a partial tang (so it would not conflict with the beautiful wood), yet be substantial enough to withstand any use that the knife would be subjected to. After forging and fitting a stainless steel guard and carving the groove into a block of bois de rose, the knife was ready for assembly. With everything clamped into place, a hole was drilled for a stainless steel pin. Some epoxy (I call it an insurance policy) was applied and the knife was assembled. The knife got a final sharpening and was able to whittle the hairs on my arm without skin contact. That is pretty sharp! Along the way, I decided to make a sheath as well. Overall, I am quite pleased with the result. The lump of metal that was on my shop floor finally got to fulfill its potential and I was able to share this with you. The recipient of this seemed quite pleased as well. I was cleaning up some corners of my shop the other day and came upon a lump of metal. I had started making a damascus (pattern-welded) billet a few years ago and must have become distracted. I had two reasons to re-visit the project; one was to make a gift for someone and the other was to work on my resolution to finish more projects that I have started. It only took a few more heats to double the billet back onto itself a few times and achieve my goal of about forty layers. A few more heats and some grinding left me with something that is starting to look like a knife. Notice the two lines marked on the ricasso area. 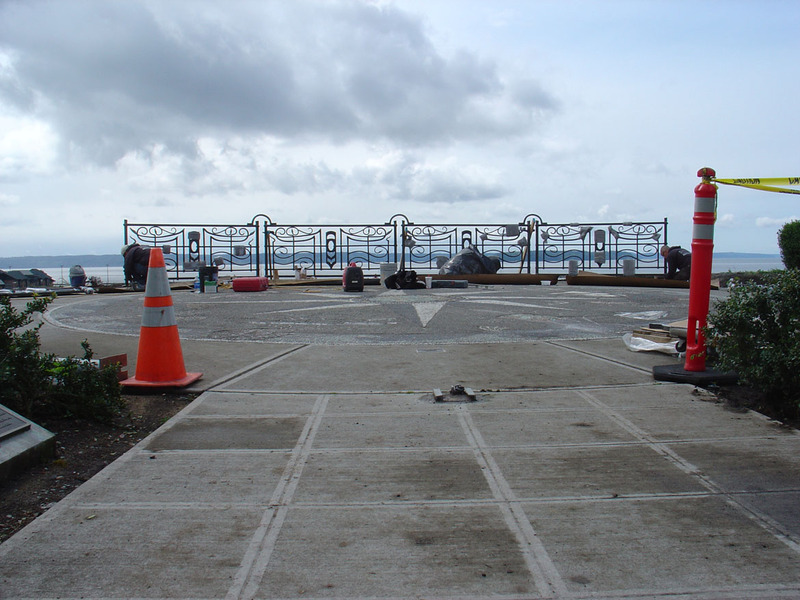 This will be the transition area into the sharpened edge. It is marked the same way on the other side. After some filing to establish a soft transition, I am able to grind back to the line I have filed. This is about the extent of the aggressive grinding. Notice that the choil is taped. The real pros probably don’t do this step, but I have found that it really helps to prevent any mistakes. Also notice that the edge is still pretty thick. This will help prevent warping during the heat treatment. It also allows me to remove the decarburized material and still have something left. The black mark on the tang tells me where I want to cut this off. After holding this in my hand, I realized that the tang I forged was too long for my desired proportions. After a few hours of grinding, filing and more refined sanding, the knife is now ready for hardening. Everything looks good. No deep scratches, no sign of inclusions trapped between any of the layers. It is sanded to about 220 grit. I wanted some “tooth” on the surface for the clay resist I intend to put along the back of the knife. If someone told you to go out and have your own unique custom new car made, you would probably think they were either way too rich or just plain crazy. Cars are expensive enough when mass produced, let alone made just for you. Interestingly, the price bump for custom made building products is rarely as substantial. There! Why settle for mass-produced when you can get what you really want? I agree with most of his points, except one. If someone were to show up at my smithy with thoughtfully considered drawings, I would give them a discount. Not only do good drawings make my job easier, it conveys to me that the customer wants to work as a team. When I have services done for me that I cannot do myself, I try my best to make their job as easy as possible. I try to think what information I would want, if I were them. And I try to keep an open mind, knowing that I don’t know everything. I’m excited to be teaching a class at Pratt Fine Arts Center again! 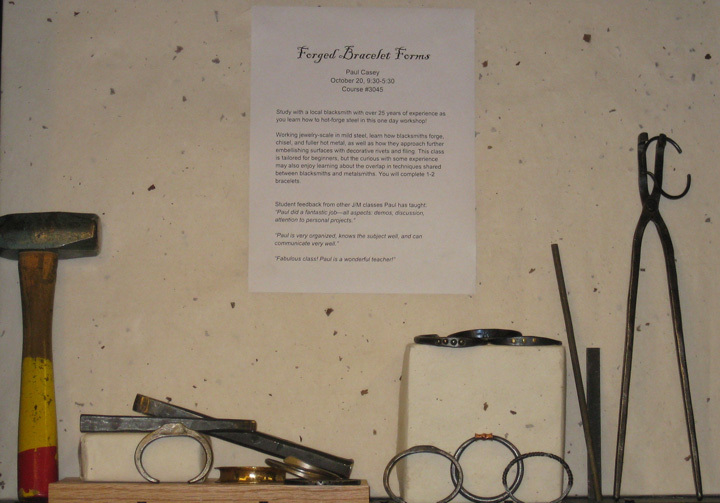 This time it is a one-day workshop on forging simple bracelet forms (such as cuff bracelets) in Pratt’s nicely equipped jewelry studio. Display and photo by Rebbecca Tomas. The class is primarily intended for jewelers interesting in working some hot metal and expanding their vocabulary of metal working skills. However, novice blacksmiths who are interested in delving into the world of jewelry will also be interested in some of the jewelry making aspects. Steel will be the primary metal used, with some demonstrations using other metals. Heat it! Hammer it! Bend it! Wear it! The class was great! Plenty of enthusiasm and energy! Buy locally. Is it so new? The concept of supporting a local economy, using regional resources, might seem like a new idea. But what did people do before the internet connected us on a global level? They bought locally. As an artist/craftsman/blacksmith with 30+ years of making stuff to fulfill the needs of happy customers, this is not such a new concept. The commissioning process seemed so much simpler back in the ’80’s. People wanted stuff made and they found someone to make it. There was maybe an hour or so of negotiating, discovering that both parties had sufficient integrity (the artist will produce and the client will pay what was agreed upon). And thus a deal was done. It is a different world now. So much design taste is thrust upon us by mass-marketing of production-made goods. An example that comes to mind is the iPad. It really is an elegant design, thoughtfully considered. But have you ever wondered how many identical objects are made to meet the need of consumers? It is a one-size-fits-all approach. What do you think an iPad would cost if you were to contact Apple and ask for one 1/2 inch larger? Or 1/4 inch smaller and an ounce lighter. I suggest you try. This is the need where a local artisan/blackmith can really shine. Do you buy a suit off the rack, or do you get one custom made? 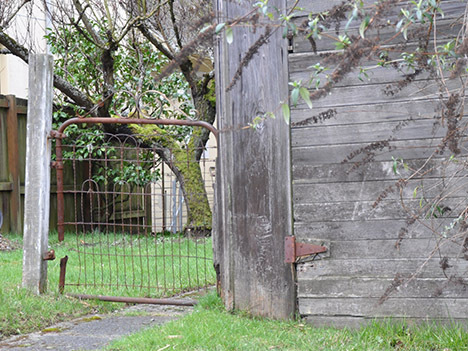 With a 2,000+ year history, the local blacksmith in your community has not gone away. We just stopped shoeing horses about a hundred years ago. We are still equally driven to make customers happy. It might seem odd, in a time of specialization, to find someone capable of making light fixtures, lighting fixtures, railings, hand rails, shelf brackets, curtain rods, drapery hardware, pot racks, cabinet and door hardware, fireplace screens, fireplace tools, fireplace andirons, fireplace surrounds, fireplace grates, handrails, gates, entry gates, driveway gates, wrought-iron fences, hinges, latches, resoration work, sculpture, design consultation, window grilles, nails and so much more. That is what we do. This is something that I made many years ago, yet I still smile every time I see it. 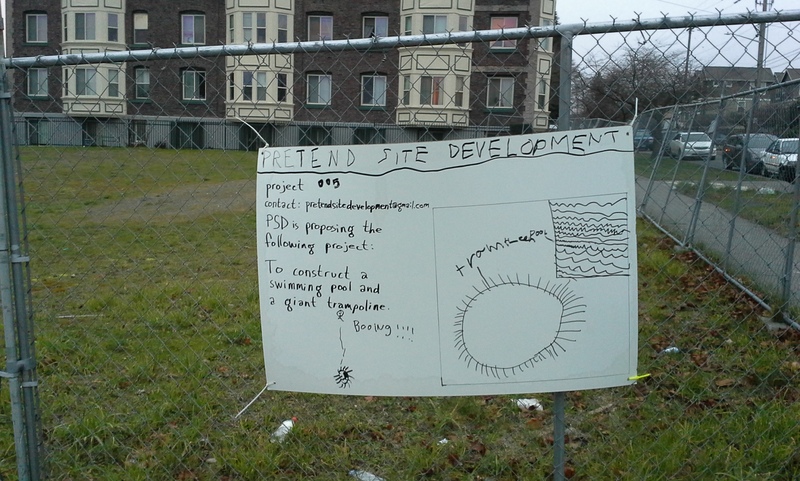 It was an interesting project. The springs were all hand-forged and heat-treated, no stock components were used. The mechanism, hidden inside the case, was a delightful challenge.